The UK Foreign Office summoned the Russian ambassador on Thursday afternoon to lodge a complaint about the flight of Russian military jets over the English Channel, which authorities claim posed a danger to passenger aircraft. On Wednesday the Ministry of Defence (MoD) confirmed a number of Royal Air Force Typhoon jets were scrambled in an attempt to intercept the Tupolev 95 ‘Bear’ Aircraft which were flying along the south coast. The FCO, however, said that while they were never in the UK’s airspace, their patrol posed a threat to civil aviation. “While the Russian planes did not enter sovereign UK airspace and were escorted by RAF Typhoons throughout the time they were in the UK area of interest, the Russian planes caused disruption to civil aviation. That is why we summoned the Russian ambassador to account for the incident,” a spokeswoman said. Authorities did not specify, however, what the threats to civil aviation were. The Russian ambassador to the UK, Alexander Yakovenko, met with the FCO Permanent Under-Secretary Simon Fraserat on Thursday. In a statement, the Russian Embassy said: “Ambassador Alexander Yakovenko stressed that the concerns of the British side are not understandable given that two Russian military aircraft were on a routine air patrol duty over the high seas of the Atlantic Ocean. While it is not an uncommon practice for Russian military jets to fly along England’s south coast, there have been several incidents of RAF fighter jets being scrambled to ensure Russian aircraft do not encroach on British airspace. 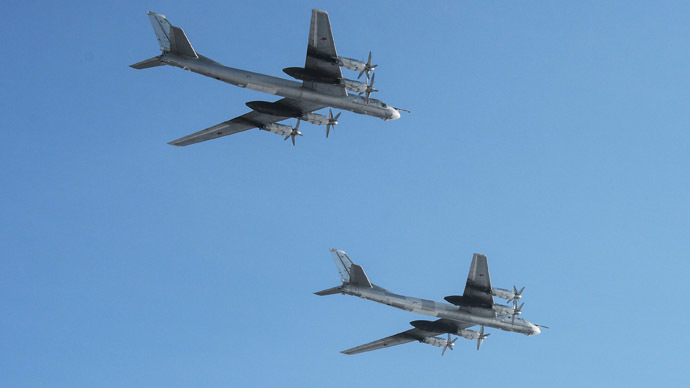 Russian Air Force spokesman Colonel Ivan Klimov said the strategic bombers took off from Russia’s Engels air base on Thursday and had successfully completed their tasks according to an air patrol plan. The flight route passed above neutral waters of the Barents and Norwegian seas, as well as the Atlantic Ocean, the colonel said, adding that the flights lasted for over 19 hours, with two mid-air refueling operations carried out during the mission. He said the air patrol flights were carried out according to an approved plan, and were conducted in strict compliance with international regulations of the use of airspace above neutral waters, without violating other countries’ borders. The number of Russian jets being intercepted has risen throughout Europe during the past year. Speaking in Brussels on Thursday, Jens Stoltenberg, Secretary General of NATO, said in the past year more than 150 interceptions of Russian aircraft were carried by NATO forces on missions patrolling the Baltic States, four times as many than in 2013. “Therefore we remain vigilant,” he added.